We all love a bit of takeaway food, right? It’s easy, it’s delicious (at the time) and it’s always a hit with the kids. But it’s also expensive, often horrible for our bodies and usually not nearly as satisfying as a freshly prepped meal. So how can you satisfy these takeaway cravings without leaving the house? By getting the kids to make the meals instead (with your supervision and assistance, of course!). Not only can this save you heaps on takeaway costs, it teaches your kids about nutrition and lets them give cooking a go. Plus, you get to be the honorary taste-taster. Perfect for kids in the kitchen, these makeaway recipes work for adults and kids alike. Over the school holidays we decided to skip all forms of takeaway and try new flavours and recipes at home. Rather than caving to the salty chips and hamburger hankerings and after-dinner takeaway dessert cravings, we’d make our own meals and treats. The kids were out of school. They were driving me mental and clearly needed a challenge. So into the kitchen we went. Cooking with Kids … and we did! 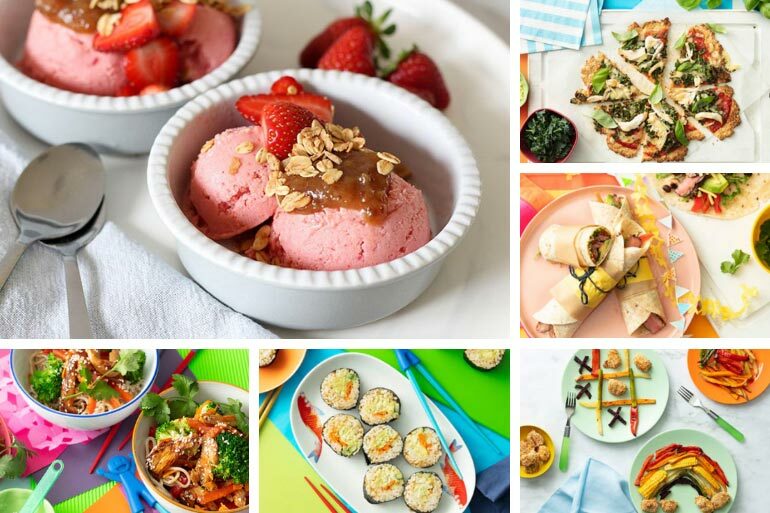 Woolworths recently put together a fantastic Cooking with Kids section on their website that highlights several delicious meals that you can easily make at home, with the kiddies. There’s takeaway lunch staples such as sushi, dinners including nuggets, chips and pizza and even desserts such as frozen yoghurt. Each of these meals can set you back from $25 to $50 in a takeaway shop to feed a family. Make them at home and you not only skip the excess salts, preservatives, sugars and oils, but also the extra costs. Plus, you control what goes into the meals while teaching your kids the importance of making nutritious choices. Valuable lessons indeed. I convinced my eldest son James, 9, to take part in the challenge with me. 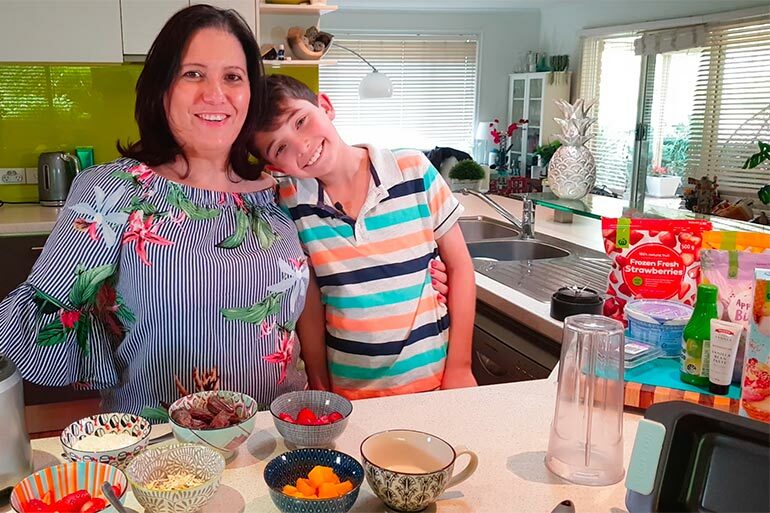 He’s already quite interested in cooking and was super keen to learn more after going on the Woolworths Discovery Tour last month. Plus, he has a longer attention span than my younger son, who lasted about five minutes before deciding that Teen Titans Go was far more interesting than making our own dessert. As our first recipe, we opted to try frozen yoghurt. This is a favourite with my boys, but often quite expensive at the shops – at least $5 for a small serving. Add a few toppings and you’re up for a small fortune. 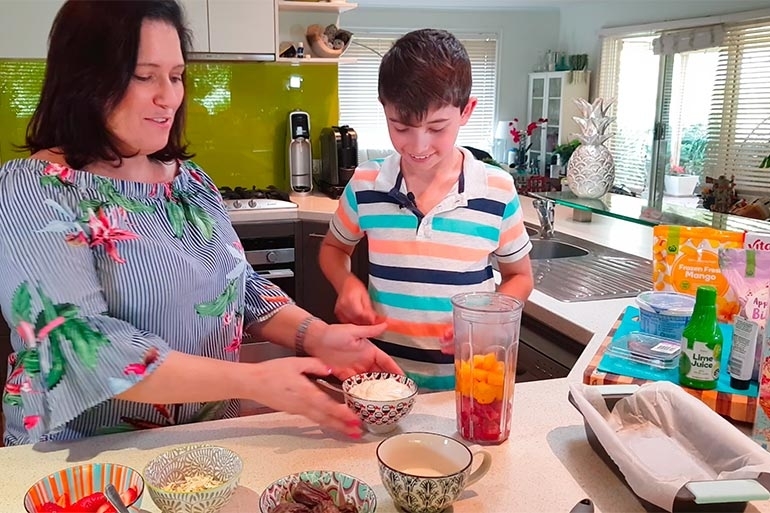 This Woolworths frozen yoghurt recipe calls for FIVE super-simple steps, all of which Master 9 could easily do on his own, with me watching him. Again it’s all in the prep and to be honest it’s mainly measuring so super kid-friendly. 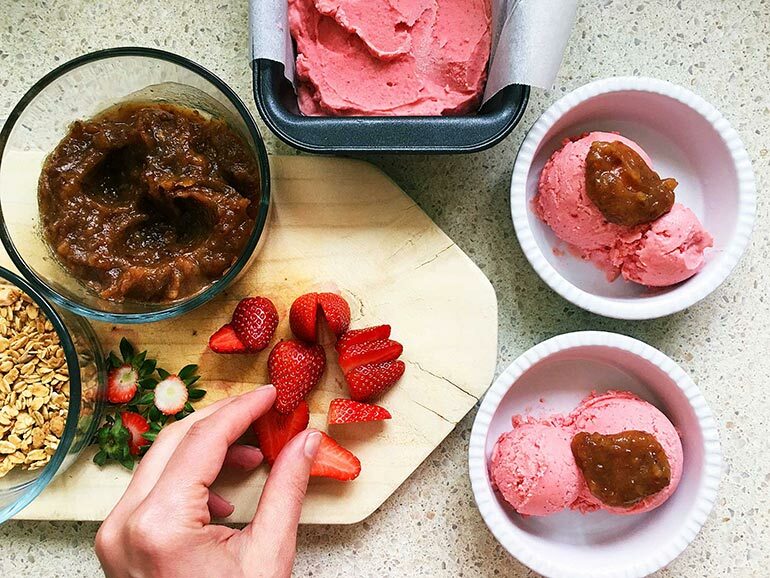 You can get the recipe at the Woolworths Cooking With Kids site, but, if you have fruit and yoghurt (for the frozen yoghurt), oat milk, vanilla and dates (for the gooey caramel sauce) and a selection of your fav toppings, then you’re pretty much ready to rock and roll. Like many kids, James isn’t usually keen on trying new foods, such as dates. He lovingly referred to them as “dried-up dog turds”. But when he combined ‘dog turds’ with oat milk, he agreed it really did taste as yummy as caramel sauce. It took about 15 minutes to prep the fruit, make the sauce, chop the toppings and put it to set in the freezer. James did most of the work, and to be honest it was refreshing to sit and watch him. And even more refreshing not having to dish out $25 for the end result! It’s so important for kids to learn about nutrition and how to make a few easy meals. This challenge does both of these things. It builds their confidence to cook, to explore new tastes and to make something that they are proud of. James was over the moon with how his creation turned out. It was just as yummy as takeaway frozen yoghurt! Make Your Own … and Save! 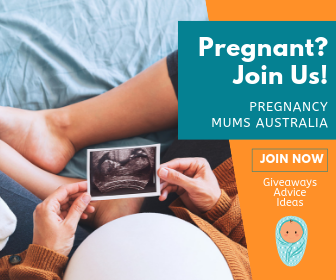 So, mums and dads, now it’s your turn. Head over to Woolworths and check out their recipes. So next time you think about takeaway chicken and chips, pizza or noodles, get the kids to help cook up a feast instead. If you swap one takeaway meal for one makeaway meal every week, you’re saving about $150, give or take, over the month. We worked it out at $50 for a family pizza night, $35 for a Maccas meal, $25 for a fro-yo fix and $40 for a family sushi session. But every family is different! You might even save more! So who wants to join us? 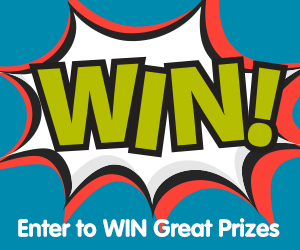 Comment below with “I’m in” and let’s have some fun cooking with our kids!